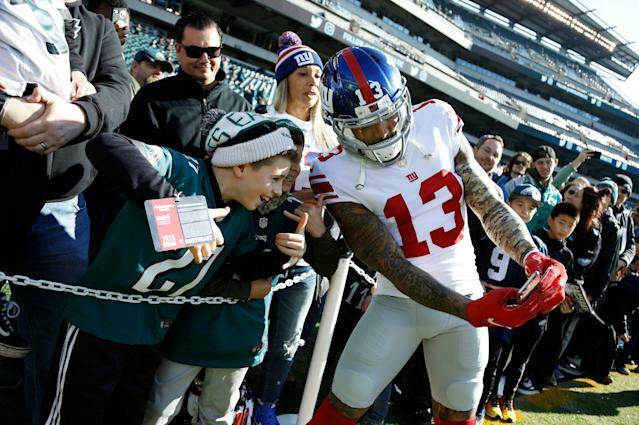 Like anything else, the truth about Odell Beckham off the field probably isn’t what many of us perceive from the tabloid stories. Beckham was traded from the New York Giants to the Cleveland Browns, a move that became official on Wednesday. Beckham’s time with the Giants was full of drama and back-page headlines. It’s safe to say that all had something to do with the Giants moving him just one year into his huge contract extension. But NFL Network’s Kimberly Jones told a story about a different side of Beckham, after she had had a near-death experience. On NFL Network, Jones told about returning to work on Dec. 31, 46 days after suffering an aortic dissection that threatened her life. She returned to interview some Jets players in the locker room, she said. At 7 p.m. that night she got a text from Beckham, with a link to a video of her interviewing him after a Giants win a couple years earlier. Is Beckham misunderstood as a teammate? Jones wasn’t the only one to offer a positive opinion on Beckham after the trade. Former NFL offensive lineman Geoff Schwartz, who now works in the media, said Beckham was a good teammate. He played two seasons with Beckham. How Beckham fits in with the Browns will be a story, though it won’t be the draining 24/7 type story it was in New York. Cleveland is a different market than New York. But maybe it won’t be the difficult transition some seem to think it will be.